How should I quilt this???? Thread: How should I quilt this???? I have been looking at this for days and I still don't know how I want to quilt this. I thought of one all-over FMQ but I'm afraid that would be too boring. 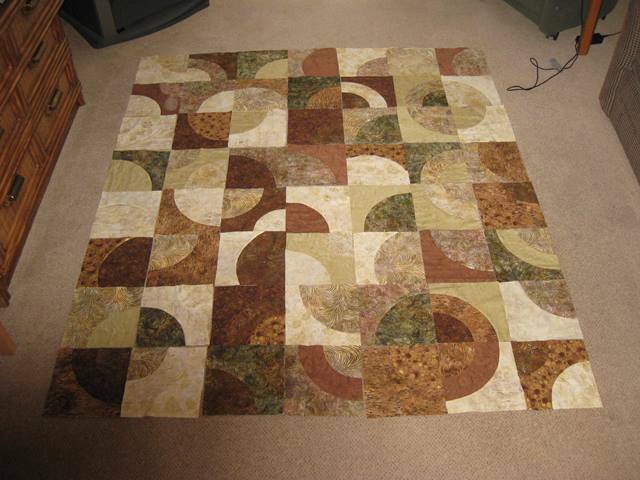 I have considered quilting a different motif in each block but I don't want it so busy that it overwhelms the design. I have also considered a different motif on every second block with the other blocks done in the same FMQ - perhaps some swirls or circles. I am really at a loss so all suggestions are welcome. My suggestion would be-the "pie slice" part of the block lends itself to lines like Sun rays, picture 1/4th of a Dresden plate. The "pie crust" part of the block would look good with some type of curved line design. Your quilt top is beautiful! Do you plan on it being a wall hanging or a quilt to keep someone warm? I would do different and opposing filler designs in each of the elements ... but nothing "formal". Ripples, pebbles, meanders, swirls, mctavish ... etc. By "opposing" I mean that each section that touches each other has either a pattern in a different direction or patterns that "clash" (ripples next to swirls for example). If it's going to be a quilt to keep a body warm I would use perhaps no more than 3-4 different designs and quilt them fairly loosely. If it's going to be a wall hanging I would choose a wider variety - 5-7, and quilt it more densely. Thank you for the advice and the compliment. The pattern is Elegant Expressions designed by Elizabeth Allocco. I wanted it as a bed-sized quilt so I added more blocks. What a great quilt!!! I have no advice for quilting it, but it sure is pretty! Beautiful quilt. My first thought was to keep the circle shapes to stand out. Enormous snails swirly shapes. Love your quilt - beautiful colours - very autumnal like falling leaves. How about an all-over design of larger leaves. This was my first thought, too. I would make it like a New York Beauty. I love that pattern. Echo quilting inside the "pie" would be pretty. You have many options. So lovely. I like your quilt a lot an agree with Cybraian's suggestion. It'll look great!